Let's review the best and the worst fantasy performances through Thursday and Sunday's games so far in Week 12's Fantasy Football Wrap Up. Ben Roethlisberger threw for 351 yards, 4 touchdowns, 2 interceptions, and ran 3 times for 25 yards - Big Ben finished as the highest scoring QB of the week with 30.50 fantasy points. Philip Rivers ate on Thanksgiving against the Cowboys, throwing for 434 yards, 3 touchdowns, and did not throw an interception. Rivers finished as the second highest-scoring QB in Week 12 with 28.90 fantasy points. For the second time in as many weeks, Dak Prescott had a terrible outing, this time on Thanksgiving against the Chargers. Prescott threw for 179 yards, 0 touchdowns, 2 interceptions, and uncharacteristically did not run the ball. Prescott finished the week as the fourth-worst ranked QB and scored 3.20 fantasy points. Jacoby Brissett couldn't take advantage of a great matchup against the Titans, throwing for only 196 yards, 0 touchdowns, and 0 interceptions while running for 16 yards on 3 carries, totaling 7.40 fantasy points. Will he ever be stopped? Saints' Alvin Kamara continues to dominate week after week and finds himself as the highest-scoring running back of the week with 36.80 fantasy points. The damage was done both on the ground and through the air - Kamara had 87 yards and a touchdown on 5 carries and caught 6 passes for 101 yards and a touchdown on Sunday. Fill-in running back Jamaal Williams scored 29.50 fantasy points and finished as the second-ranked running back of the week. Williams ran for 66 yards and a touchdown on 21 carries while catching 4 passes for 69 yards and a touchdown. C.J. Anderson was not given much opportunity to get going against the Raiders on Sunday and has seen his role decrease over the past few weeks, as he was out-snapped by teammate Devontae Booker. Anderson gained 12 yards on 5 carries and finished with no targets in the passing game, totaling 1.20 fantasy points. Just when we thought James White had an integral role in the Patriots' offense, he posts a couple of poor performances. White is again a disappointment this week after gaining 13 yards on 3 carries, and 2 yards on 1 reception, totaling 2.50 fantasy points. Going into the final weeks of the fantasy regular season, owners are taking a huge gamble by having him in the starting lineup. 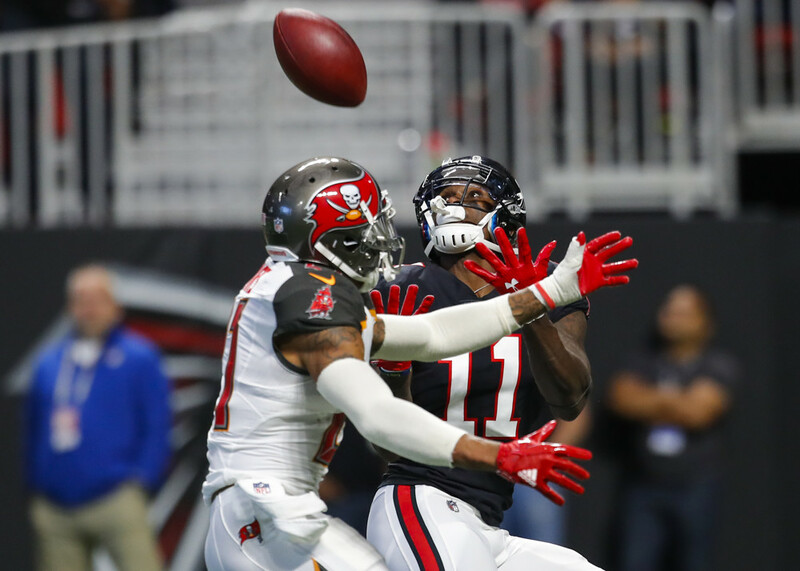 Julio Jones was on another level on Sunday, torching the Buccaneers defense for 253 yards and 2 touchdowns on 12 receptions. Jone's huge outing is welcomed by fantasy owners heading into the last few weeks of the fantasy season, after only scoring 1 touchdown in his previous 10 games. Jones finished with 50.80 fantasy points and finished as the highest scoring wide receiver of the week. Antonio Brown had another productive outing for the second time in two weeks, hauling in 10 receptions for 169 yards and 2 touchdowns. Brown was also able to snag a two-point conversion, and finished week 12 as the second-highest scoring wide receiver with 40.90 fantasy points. Without Jay Cutler throwing him the ball, DeVante Parker has not produced and is quickly becoming the third-fiddle in a competitive wide receiving group. This week Parker could only haul in 1 of 3 targets for 5 yards, totaling 1.50 fantasy points. T.Y. Hilton has been hit-and-miss all season long, and this week was a miss. Hilton caught 2 of 5 targets for 15 yards and finished with only 3.50 fantasy points. The highest-scoring tight end from this past week was the Zach Ertz who had 10 receptions for 103 yards and 1 touchdown. Ertz finished the day with 26.30 fantasy points and continues to be trusted down the stretch. Rob Gronkowski finished with the 2nd-most fantasy points for tight ends with 25.2. Gronk had 82 yards and 2 touchdowns on 5 receptions and continues to be a nightmare to cover for the opponent. Vernon Davis' situation entering Thursday's game could not have been better: teammate Jordan Reed was still ruled out due to injury and he was playing against the New York Giants who, going into the matchup, allowed the most fantasy points to tight ends. Davis was kept in to block most of the time with an injury-riddled offensive line, and Davis finished with 0 fantasy points. Davis was shockingly only targeted once and left owners everywhere looking for an explanation as to the (non) usage. Jared Cook didn't enter Sunday's game with the same opportunity as Davis, but the game developed as so. Michael Crabtree was tossed from the game and Amari Cooper left the game with an injury. While Cook was targeted 5 times, he caught 1 pass for 1 yard and totaled 1.10 fantasy points. The highest-scoring defense of the week was the New England Patriots Defense who were able to sack Matt Moore early and often. The Patriots recorded 2 interceptions, 1 fumble recovery, and 7 sacks, scoring a total of 18.00 fantasy points. The second-highest scoring defense this week was the Los Angeles Chargers Defense who had 2 interceptions (1 returned for a defensive touchdown), and 2 sacks. The Chargers defense finished their Thanksgiving Day with 18.00 fantasy points. This week's highest scoring kicker was Arizona Cardinals'Phil Dawson who kicked field goals from 34, 42, 48 and 57 yards out and converted 1 extra point. Dawson finished week 12 totaling 17.00 fantasy points. Also tied for the highest scoring kicker of the week was Greg Zuerlein who kicked field goals from 26, 46, 49 and 50 yards out on Thursday night while also added 2 extra points. Zuerlein finished the week with 17.00 fantasy points.